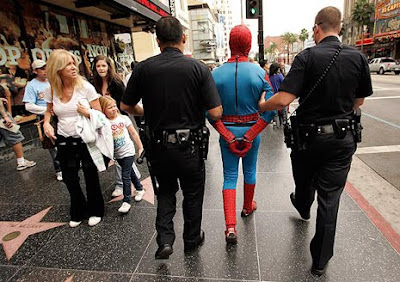 Spiderman, the legendary superhero and movie star was arrested on Hollywood Blvd for outstanding criminal warrants after an incident in which he allegedly slugged a man. The rest of the celebrity community at Hollywood an Highland, including the Incredible Hulk, Elvis, Sponge Bob Square Paints, and Darth Vader are said to be in shock. This incident is not unique. Recently, Chewbacca was arrested for allegedly head-butting a tour guide. 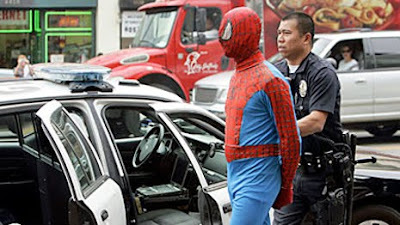 Two years ago, authorities convened a "superhero summit" designed to reduce tensions among the performers! Bad superheros we don't heart you!